Crash-and-smash protection. No-BS pricing. Comprehensive Z-Wave device support. Cameras with motion sensors. Simplistic primary control panel, too-small touch-screen. System does not report status of Z-Wave devices. FrontPoint primarily targets the do-it-yourself crowd, but will connect you with a professional installer if you’d prefer to pay someone else to hook everything up. 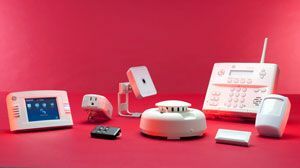 Our review is based on self-installation using similar components to what ADT and Vivint include in their package deals. Thanks to FrontPoint’s excellent documentation and telephone support (needed only for system activation), we had the entire system installed in less than 30 minutes. We find the company’s straightforward and consumer-friendly approach to the home-security business refreshing. You don’t have to jump through hoops to find out how much anything costs, both the hardware and the monitoring are reasonably priced, and you’re free to buy only the components you want, versus getting stuck with a prefab package that might not fit your needs (although the company offers those, too). FrontPoint won’t force you to sign a long-term contract, either, but it will entice you with progressively higher equipment discounts if you do, topping out at $300 for a 36-month commitment. The monthly monitoring fee is $49.99 either way. With the discount included, a FrontPoint home-control/home-security system costs about 30 percent less than an ADT system with similar capabilities (we included a door lock in FrontPoint’s package, a feature ADT does not support), and FrontPoint’s monthly monitoring fee is eight dollars per month less than ADT’s. A discounted FrontPoint system will cost three times more than a Vivint system with similar capabilities, but its monitoring will cost $19 less per month. If you don’t sign a contract with either company, FrontPoint’s system will cost $285 less than Vivint’s, and the monitoring prices will be the same. You might want a different mix of components than we’ve specified, however, which could have a significant impact on price comparisons. ADT makes apples-to-apples comparisons difficult, because they don’t publish per-unit prices. Vivint does, and most are considerably higher than FrontPoint’s: Vivint charges $60 for each surface-mount door/window sensor, for instance, while FrontPoint prices them at $32.99 each. And a smoke detector costs $120 through Vivint versus $64.99 at FrontPoint. FrontPoint system uses GE’s Simon XT (Ver. 2) control panel, which can be mounted to either a wall or a table-top stand. It’s outfitted with a two-line, backlit, text-only LCD and an illuminated rubber keypad with dedicated buttons for arming the system when you leave home, arming the system when you intend to stay, and a third button for disarming the system. There are also three dedicated buttons for signaling police, fire, or medical emergencies. The Simon XT is an all-in-one unit with integrated GSM and Z-Wave control modules. It connects to the Internet via your Wi-Fi router, so the only hard-wiring needed is for power (there’s a 24-hour backup battery, too). Other than video-camera streams, all system data are relayed to the central monitoring office over the GSM connection, so a burglar cannot cut your land line to disable the alarm system. The control panel has a built-in piezo siren and speaker, and speech capabilities in the form of a female voice with a distinct British accent that reminded us of James Bond’s Miss Moneypenny. The voice has a 212-word vocabulary and can inform you of sensor activity (doors opening and closing, for instance), Z-Wave commands sent from the keypad (such as when you turn on a light in a remote part of the house), arming and disarming confirmations, and more. The Simon XT is not very attractive or user friendly, but you can add GE’s Two-Way Talking Touch Screen to the system for just $140. This 3.5-inch color LCD performs many of the same functions as the larger panel, including reporting system status, lighting control, arming and disarming the alarm, and more. Linked to a Z-Wave thermostat, it will display the outside temperature along with local weather forecasts, and you can use it to control your HVAC system. The FrontPoint Security system we assembled included both the control panels described above, one motion sensor, one wireless smoke detector, two low-profile surface-mount door/window sensors, a fixed-position wireless IP camera with a motion sensor of its own, a GE Z-Wave on/off plug-in module, and a key fob for remote arming and disarming. FrontPoint contracts with Alarm.com for monitoring, and the Simon XT control panel takes advantage of Alarm.com’s protection against crash-and-smash break-ins. FrontPoint supports Schlage’s line of Z-Wave entry and deadbolt locks, although they don’t sell locks (or Z-Wave thermostats) directly. We also found FrontPoint’s system compatible with Kwikset’s Z-Wave locks. FrontPoint offers two types of indoor cameras, fixed position and pan/tilt, both of which are equipped with motion sensors. The company also offers an outdoor camera that we did not evaluate. The cameras deliver mediocre image quality that’s on par with the cameras ADT provided, but having motion sensors is an important benefit that ADT does not provide: FrontPoint’s cameras can be set up to capture video clips or snapshots even if no other sensor in the system is tripped. The cameras can also record in response to activity in the rest of the system: Every time the system is armed or disarmed, if a sensor opens, or if any sensor triggers an alarm state. The pan/tilt cameras cost $100 more than the fixed models, but they’re capable of covering much more area because you can move the camera’s lens left and right and up and down using a web browser or Alarm.com’s smartphone app. You can also define and label several preset camera positions. When it comes to alarm states, FrontPoint’s system behaves very much like ADT’s. The panel will send an alarm signal to Alarm.com, and an agent will attempt to contact you using the contact numbers you’ve provided. If they’re unable to reach you, they'll call police or fire authorities, as appropriate, to dispatch a response. FrontPoint’s system can accommodate Z-Wave lighting controls, thermostats, and door locks, but the only Z-Wave device FrontPoint sells directly is a GE 45603 Z-Wave plug-in on/off module. Unlike ADT, however, FrontPoint does not prohibit you from adding other Z-Wave products. We successfully tested the system with a mixture of in-wall Z-Wave switches and dimmers from Leviton and GE, Z-Wave locks from both Kwikset and Schlage, and were even able to set up a Leviton 4-Button Controller with Switch that representatives from both FrontPoint and Alarm.com didn’t think would work. As with ADT’s system, sensors can be programmed to trigger Z-Wave devices, so that opening a door will automatically turn on a light (with qualifying rules, so this happens only when you expect it to be dark). But the Alarm.com software that FrontPoint uses is much more sophisticated than ADT’s solution. Read our review of Vivint’s system for additional details (both companies rely on Alarm.com’s software). The Simon XT control panel is the weakest link in FrontPoint’s system, especially if you have a large deployment of sensors and Z-Wave devices. You can’t rename devices on the panel beyond “Door 1,” “Light 3,” and so on (you can do that through the Web interface, but that’s not what will appear on the primary control panel). And the touch-screen companion is much too small for frequent use. But FrontPoint’s equipment and monitoring prices are very attractive, and if you find that you use your smartphone and/or the web interface to manage the system, you’ll soon forget about the control panels anyway. Thanks to Alarm.com’s technology, we find this solution to be far more secure than ADT’s, and the home-control features are far better than that system. FrontPoint Security is definitely worthy of consideration, but Vivint offers more sophisticated technology. Don't miss our comprehensive home-security/home-control feature story ! ADT does not sell any systems without a monitoring contract. Without a monitoring contract, FrontPoint's equipment price increases to $1,414, but its monitoring fee remains the same.